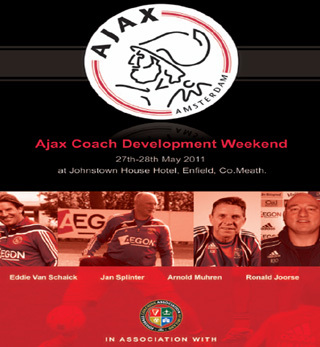 Ajax Coach Development Weekend comes to Ireland !! 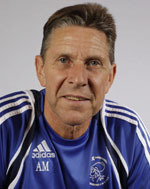 The FCAI have launched the Ajax Coach Development Weekend, taking place on 27th-28th May 2011 at the Johnstown House Hotel, Enfield, Co Meath, offering local trainer coaches the unique opportunity to learn from some of the best academy coaches in Europe! forward to a mix of practical sessions and presentations on topics including the Ajax athletics skills program, goal keeping sessions, coach career insights and much more. 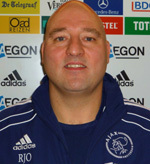 The Ajax Youth Development Concept will be the basis of all teaching over the weekend. Their philosophy is heavily based on the following areas; discipline, education, speed training, sprints and player development. Coaches who attend the Ajax Coach Development Weekend can expect to learn about the Ajax Youth Development Concept in detail. Ajax has been voted the best youth academy in Europe in 2010, local coaches who attend will really be learning from the very best Europe has to offer! 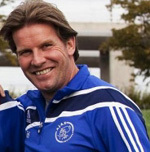 The Ajax coaching clinic is bound to book out quickly so act now to secure your place for the weekend. For further information or to book your place please contact colin@thefcai.com or call 0044 7702823700. Special discounts for group bookings are available. The Johnstown House Hotel is also offering special discounts for coaches attending the Ajax seminar, please contact the FCAI for further details.